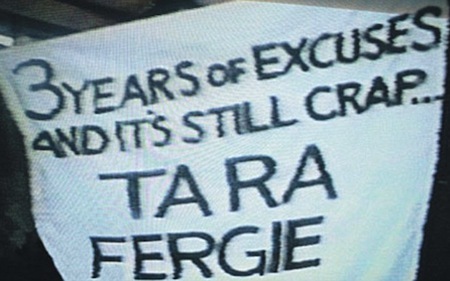 The protest banner displayed by Manchester United supporters in the Winter of 1989-90 indicated that, after three years in the job, manager Alex Ferguson had failed to bring the success the club deeply craved. It has become part of footballing lore that Mark Robins’ goal against Nottingham Forest in the 3rd Round of the FA Cup that season saved his career. This may or may not be true, but United went on to win the Cup and over the subsequent years Ferguson has become the most successful manager in the history of English football. This reminds me that preparation and hard work are often not recognised until everything comes together; that after three years of my PhD, I will soon have something to show for it; and that it might just possibly lead to something bigger. This entry was posted on Friday, October 7th, 2011 at 10:44 am and is filed under Posts. You can follow any responses to this entry through the RSS 2.0 feed. You can leave a response, or trackback from your own site.